Saturday Night Soldiers follows the progress of the Territorials in the 4th Lincolns in WW2, from the ill-fated campaign in Norway to Iceland, Normandy, Belgium, Holland and Germany. 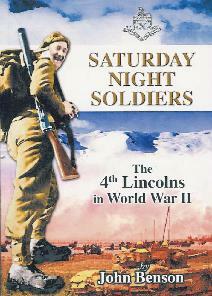 Saturday Night Soldiers is available at bookshops (ISBN 1 902882 51 2) price £16.50 or (signed) from the author, John Benson, 3 Hall Yard, Burton LN1 2RD price £18.25 inc postage. 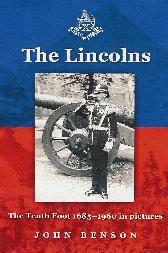 The Lincolns (ISBN 1 902882 55 5) can be obtained from bookshops for £17.50 or (signed) by the author (address above) for £19.25 inc post and packing. Almost all of the pictures on this website are included in the book. All the King's Enemies (ISBN 1 902882 43 1) can be bought at bookshops price £15.95 or (signed) from the author for £17.70 inc postage and packing. Cheques should be made payable to John Benson. Overseas buyers please add £3.65 to the prices shown in red above. Euros in cash are also accepted. Contingent), Lincolnshire Echo, Lincolnshire Chronicle, Eric Croft, Phil Hoyer, Mrs R Gawthorne, Rita Sheridan, Rob Sutton, Steve Vernon, Stan Masters, J O Flint DSO MC. Midi files sequenced by Barry Taylor. Thanks to Tony of Cornelius Computers for friendly advice and help. © John Benson 2014.